Growth Habit: Foxglove is a hardy plant which can grow up to 2m in height. 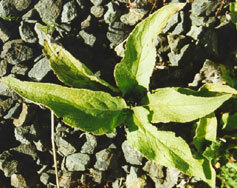 Type of Plant: A biennial plant which produces a large, leafy rosette in its first year, then a characteristic flowering spike the second year. Flowers: The flowers are a tubular bell shaped which cluster at the top of the stem. Foxglove flowers come in a variety of mottled colours including white, yellow, purple or pink. These usually hang to one side of the spike. Flowering occurs over a long period from spring to autumn. Fruit/Seed: Millions of small dark seeds are produced from each plant. Dispersal: Foxglove reproduces from seed and wind or water can transport these. Distribution: A garden escape which can be found growing naturally in many parts of Tasmania, particularly in damp and shady places. Foxglove is extremely poisonous. All plant parts must be handled with extreme care. Foxglove is able to rapidly spread and totally exclude native flora and fauna. Grubbing (summer, spring and autumn). Hoe in young plants and remove older plants. Collect and dispose of flowers and seeds. Wear gloves, as the entire plant is poisonous. Herbicide (summer, spring and autumn). Glyphosate is registered in Tasmania for foxglove use.